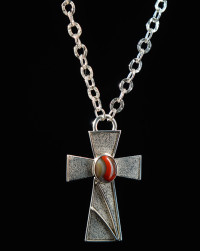 Sterling & Imperial Red KY agate Cross $ 350.00 Sterling Silver cross and chain with Imperial Red KY agate. Approximately 2.5 inches tall. Cross is 2.3″, chain is 19″. Stone: KY Agate oval 13 x 11mm.